The Board of Directors of Raytheon Company has elected James A. "Sandy" Winnefeld Jr. as a director, effective immediately. Winnefeld, 60, is a retired United States Navy admiral who served as the ninth Vice Chairman of the Joint Chiefs of Staff. He previously served as Commander, U.S. Northern Command (USNORTHCOM) and Commander, North American Aerospace Defense Command (NORAD). Winnefeld's operational commands include serving as Commander, U.S. Sixth Fleet and Commander, Allied Joint Command Lisbon. He retired from the Navy in 2015 after over 37 years of service. "Sandy brings significant expertise to our Board, including deep knowledge of the future capability needs of our customers," said Thomas A. Kennedy, Raytheon Company Chairman and CEO. "His strong understanding of the evolving international environment as well as his critical thinking on emerging technologies will be of great benefit to our company as we execute our global growth strategy." Winnefeld graduated from the Georgia Institute of Technology with a Bachelor of Science degree in Aerospace Engineering and received his commission via the Navy Reserve Officer Training Corps program. He graduated with the highest distinction from the U.S. Naval War College. Winnefeld is a recipient of the Admiral William J. Crowe Award as Joint Staff Action Officer of the Year and the Vice Admiral William W. Behrens, Jr. award as the honor graduate of his Navy nuclear power school class. He currently serves on the Board of Directors of Enterprise Holdings and Alliance Laundry Systems, both privately held. 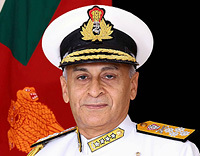 SP's Naval Forces, a bimonthly magazine records and analyses the developments and achievements of the state-of-the-art Indian Navy. It also serves as a forum of communication between the service and industry. 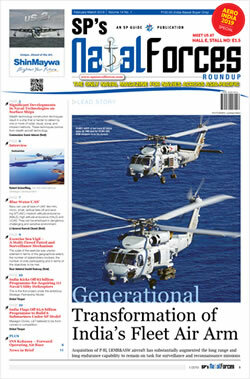 Up-to-date information on naval strategy, tactics and technology give the magazine a leading edge.